Now, to order from 1-800-flowers, you never have to dial 1800 again! Mark Zuckerberg in Facebook 2016 F8 Conference. Since mid 2016, chatbots have consistently been talked about. This is especially true in the technology sector. While few feel that chatbots are inept, some believe that they will render existing apps obsolete. Regardless, the bot platform market was filled with various frameworks. Of these, Facebook’s Bot Engine and Microsoft’s Bot Framework currently are the top industry players. But before exploring Bot builder platforms, let’s take a quick look at what exactly entails as a chatbot (just in case you are unsure). Let’s say on Christmas eve, you want to order a pizza. Due to the massive demand in the holiday season, customer service reps at Domino’s receive hundred of requests every minute and it is impossible for them to take each and every call (after all they too are human). As a result you hang up frustrated, and Domino’s loses an order! What if you could directly text Domino’s on their Facebook/Twitter page and order your favorite pizza within seconds? A chatbot, as Wikipedia describes it, is a computer program designed to simulate conversation with human users, especially over the Internet. Confused? Take a look at the image below to get a perfect understanding of the previous given example. As you can see, the whole conversation is in a Q&A format. As soon as you ask a natural language question to the bot, it intelligently parses the question and responds instantly with a suitable answer. This is just a small example of the capability of a chatbot. With time and recent advancements in Artificial Intelligence and Natural Language Processing, chatbots are becoming smarter, faster and more intelligent. Infact in a survey by BI intelligence, it is found that 80% of businesses want chatbots by 2020! But for building a chatbot, you need to first have a Bot-Building Platform. As mentioned earlier, as of today Microsoft Bot Framework and Facebook’s Bot Builder are the global leaders in this arena. Since Microsoft’s Bot platform is popular in the space of Enterprise chatbots, we are going to discuss in-depth about it in this blog. After it’s launch on March 30 2016, the Bot Framework has been constantly updated by Microsoft with tools like Language Intelligence Service, Azure Bot Service, QnA Maker, etc. The MS Bot Framework provides “cognitive microservices” which enable bots to understand natural language, analyze and also label pictures. These services are completely free for developers and can be combined in whichever way possible. The Bot Builder – It helps developers build bots that can either converse in a natural language or respond with a range of options from which the user can select. The Bot Connector – This enables developers string the bot to various bot communication platforms such as Skype, Email, Slack, etc. What makes MS Bot Framework such a Rockstar platform ? In addition to Microsoft’s own platforms, chatbots can be deployed across various other third party platforms such as Facebook Messenger, text/SMS, Kik, etc. Most of the Bot Framework’s code is now available on Github. Developers can now affix other codes to the provided sample code and improve collaboration with other development teams. One of the most important features of MS Bot Framework is that it supports Azure Bot Service – a cloud hosted bot platform. With a cloud platform like Azure, you can host bots with serverless compute resources. If you want your bot to respond quickly to a large number of user base, Azure is the way to go! As a business, you would not need a ton of infrastructure, you can respond to every customer’s query even if there is high demand/traffic, and you need to pay only for the essential cloud resources. It is also extremely easy to build a bot with Azure, you just need to pick a template set of your choice. Additionally, you have access to the basic chat simulator and code editor at the same time. This integration of development tools with simulators will be highly useful in the future as it is highly impossible to know whether a bot works or not without a real-time test tool. Microsoft’s Language Understanding Intelligent Service (LUIS) is one of the most critical tool in the Bot Framework. With LUIS, developers can build smart applications that not only understand natural human language but also respond accordingly. As soon a user sends a request, LUIS interprets the text in terms of “intents” and “entities”. The success of chatbots is largely dependent on the way they converse with users i.e. if a chatbot responds naturally, its adoption rate would be higher among users. To clearly understand how LUIS works, let’s take the example of a Movie ticket booking app. Suppose, the user sends a sentence like “Book a ticket for Fast and Furious”, LUIS understands the words “Book a Ticket” as the intent and “Fast and Furious” as the entity. Intent is the action, the user wants to take. In this example, “Book a Ticket” is the desired action. In most cases, an intent contains a verb. Entity is the specific data related to the intent and in this case, Fast and Furious is the Movie Entity. The fascinating thing about LUIS is that it uses active learning to constantly improvise itself. If LUIS doesn’t understand a phrase by the user, it immediately requests him/her to identify the intents and entities. This constant improvisation and active machine learning helps build complex interactions quickly. One thing Microsoft is heavily betting on right now is Artificial Intelligence. As time passes, aspects like AI and Machine Learning are going to be the decisive factors in the success of chatbots. Microsoft’s own intelligent assistant, Zo serves as a great example of the company’s push towards AI bots. According to Microsoft, Zo had an userbase of over 115,000 people within the first week of its launch. In addition, the tech giant also claims that over 67,000 developers are now using the Bot Framework. Microsoft also has an impressive 22 machine learning APIs. 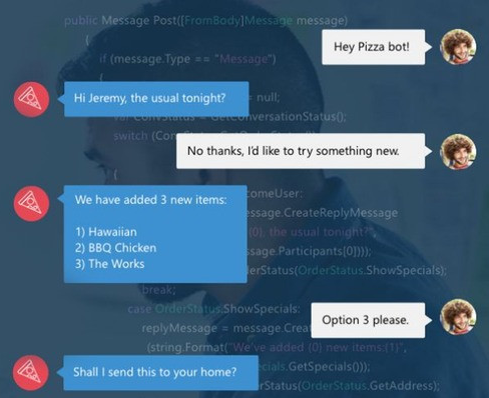 Also, Microsoft’s latest tool for Bot Framework — QnA Maker shows the company’s commitment towards creating assistants which are more intelligent, quick learners and most importantly more “human”. All in all, Microsoft’s continuous attempts to induce AI in chatbots and update the Bot Framework with valuable tools like QnA maker certainly makes its bot platform, the most favourable one in the market. Thinking of building chatbots on Microsoft Azure and Bot Framework?